This past week, Guillermo Del Toro’s film Crimson Peak premiered in theaters, which stars Mia Wasikowska and Tom Hiddleston. The film centers around Edith, a woman who marries a mysterious man named Thomas Sharpe and finds herself living in his haunted home. After seeing the film, there were some things I loved and some things I just couldn’t stand. Allow me to break those things down. I enjoyed Edith and Thomas’s love story, mainly because Tom Hiddleston is everything. However, the film neglected to put depth into their relationship. Essentially, they met; she was smitten with him; they went on a singular date; her fondness for him somehow became profound love. Their relationship seemed unreal. There wasn’t enough evidence to make the audience believe that this headstrong girl was willing to give up her life in America for some strange man she just met. I think Del Toro tried to make Edith’s life in America appear miserable by having publishers turn down her novel and killing her father. However, she still had an increasingly large support group in her hometown. I find it hard to believe that this woman, who once mentions that she would rather die a widow than marry an entitled baronet, so easily falls into the hands of Thomas Sharpe. Moreover, Del Toro attempts to develop a somewhat romantic relationship between Edith and another suitor. However, this plot point fails, as Edith moves away with Thomas and her suitor is almost entirely forgotten until the climax of the film. I think the film tried too hard to be a romance and a horror film. By detaching Edith from her American society and placing her in faraway England, it becomes more difficult to make Crimson Peak a quality dark-romantic film as it has the potential to be. 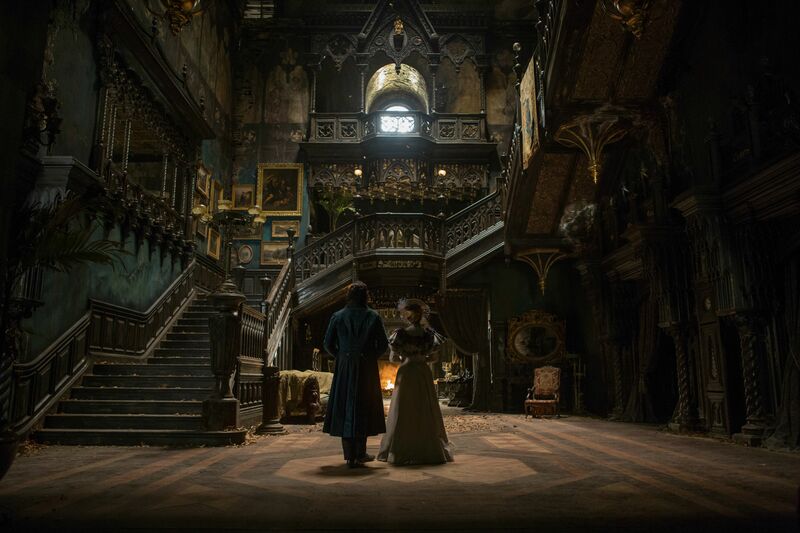 The imagery of Crimson Peak is to die for (please pardon the pun). Everything from the gothic house with the floor boards that ooze blood-like clay to the snow falling inside the old home creates a world unlike any other. The set design and costume transported me to another world. The set design may even be worthy enough for an Oscar nomination. Aesthetically, this movie goes down as one of my favorites. I loved the ghosts. At first, I hated them because of the jumpscares and the grotesque, bloody appearance. However, as the plot developed, I grew to love them because they aid Edith as she tries to save herself from the horrors of the Sharpe family. My only problem with these ghosts are that they essentially disappear halfway through the movie. These ghosts served their purpose as the horror factor in the first half of the film, but once they are revealed as secret helpers to Edith, thus no longer being scary, Del Toro essentially deletes them from the story. There’s no explanation for these ghosts either. At the end, there is a tiny monologue explaining that ghosts are tied to certain spaces, but that doesn’t explain why only Edith sees these ghosts except for after a certain main character’s death. Why does a ghost warn her of Thomas 14 years before they meet? How could this ghost know about Edith’s future? Furthermore, there are a surplus of ghosts in the Sharpe house, which led me to believe that the Sharpe’s were supernatural in some sense. I thought maybe they would end up being ghosts themselves or some other sinister creature. When they are revealed as mere murderous humans, I was a bit disappointed. Del Toro missed a prime opportunity to make these characters even scarier by making them inhuman and more connected to the ghosts. Edith is a strong female character who defies female stereotypes of the 1800s to write novels and start her own career. Furthermore, she saves herself from the evil Sharpe even when her suitor returns to save her. She can take care of herself and, in the end, saves more people than the male hero could. Film and television need more characters like Edith to show that women are not just sexual objects or weak beings. Have you seen Crimson Peak? What did you think? Let us know!